I love meeting new people! 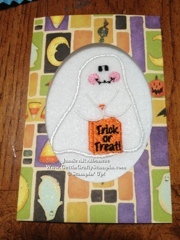 Carol DuFrene is a recent addition to my Stampin' gang and is a real hoot! I'm sooooo glad she has picked me to play with!! She described recently these lovely cards and brought them to my recent Customer Appreciation morning. I was BLOWN away! Look at the amazing embroidery that she did!!!! I dream of doing such art work some day! Here it is a Tri Fold card that encases this artwork! Ingenious! This DSP is NOT Stampin' Up! 's but a real fun look!! 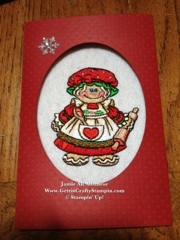 Nancy, who was visiting with us n Stampin, was amazed that these were hand crafted! 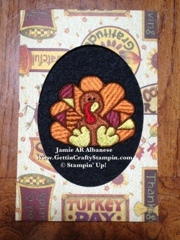 We discussed how we would totally purchase these appliqués in the store and here Carol had just created them!! Ok, a future goal is to learn this amazing craft!! Wowzaz!! So raise your glass with me and toast Carol and her lovely cards!! Whoot! Whoot!!! !